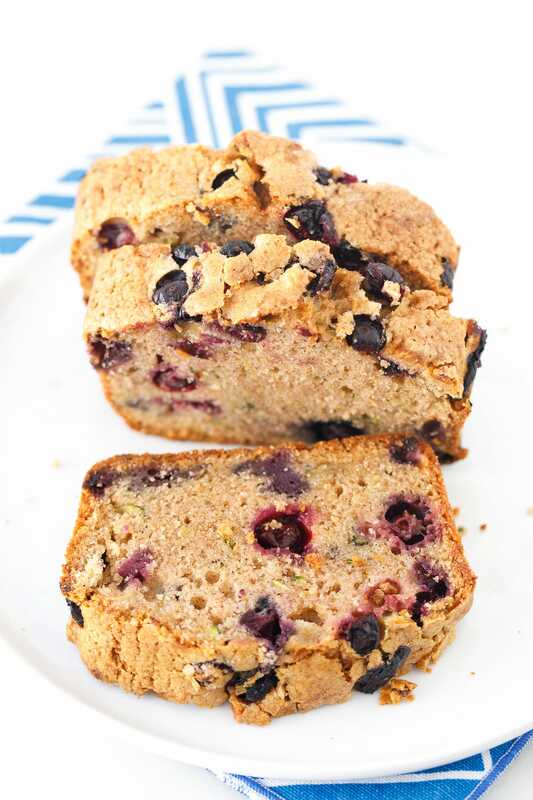 Our moist and delicious blueberry zucchini bread recipe is a crowd favorite. 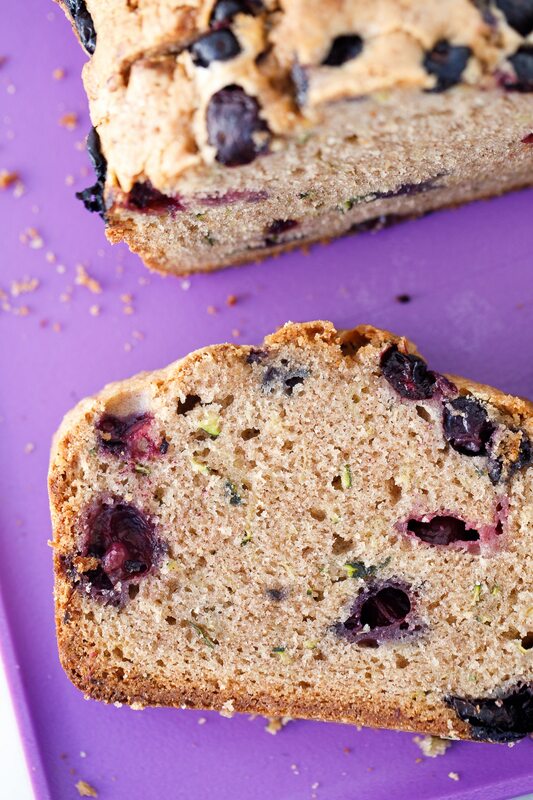 With two cups of zucchini and loads of fresh blueberries, you’re going to go wild for this popular bread recipe! I think I’ve probably mentioned this to y’all before, but, my husband loves having a treat with his coffee in the evening. Some of his faves are my orange cranberry bread and these raspberry almond shortbread cookies. Zach works really hard all day, and his evening coffee with a treat is one small way he indulges on busy weeknights. The thing is, he really prefers pastries, muffins, or bread over decadent desserts recipes. That means I bake a lot of bread, and this blueberry zucchini bread recipe (and this amazing chocolate chip banana bread) is Zach’s all time favorite. He begs me to bake this stuff ALL THE TIME! Another reason Zach really loves this bread recipe is that it doesn’t have any nuts in it. He’s been recently diagnosed with some stomach issues and his doctor has encouraged him to avoid abrasive foods, like nuts. 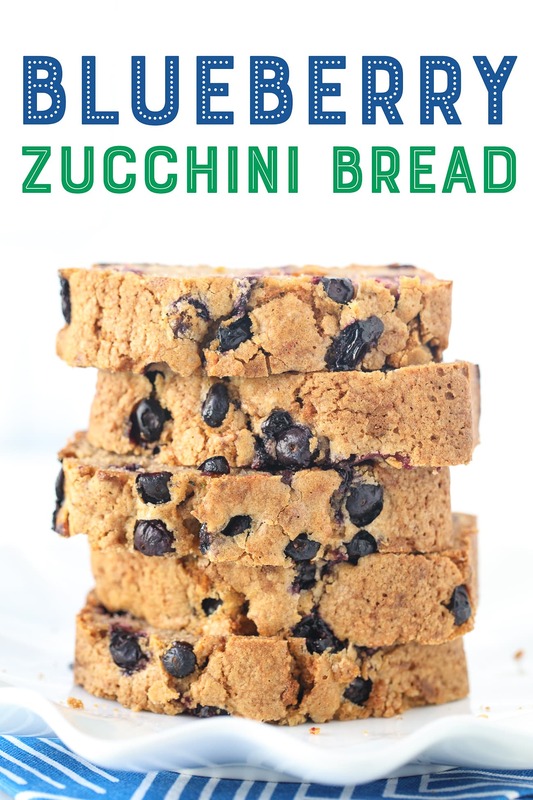 That, combined with the fact that this blueberry zucchini bread recipe is super moist and incredibly delicious, means that this is the perfect recipe to fulfill Zach’s evening coffee and a treat needs. I have to say that I also crave this amazing bread recipe. I think it’s the fact that I get a burst of fresh blueberry flavor in every bite. 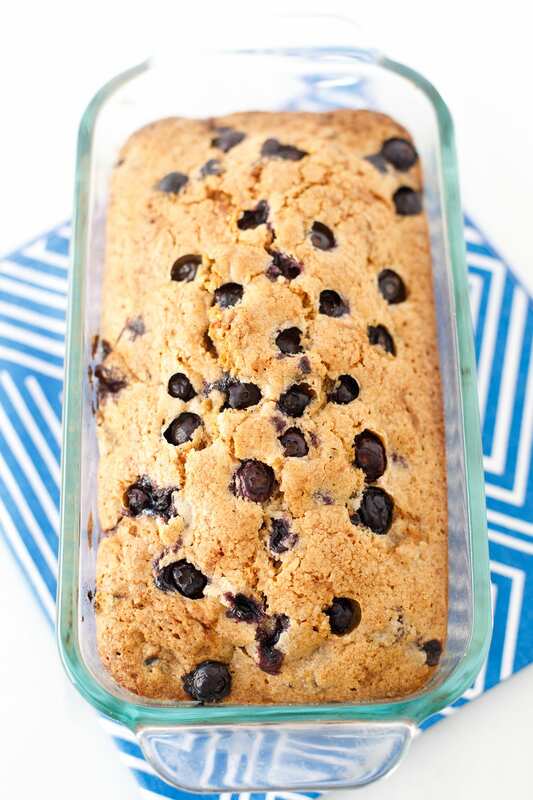 I am in love with blueberries and they taste so great in zucchini bread! Who knew? 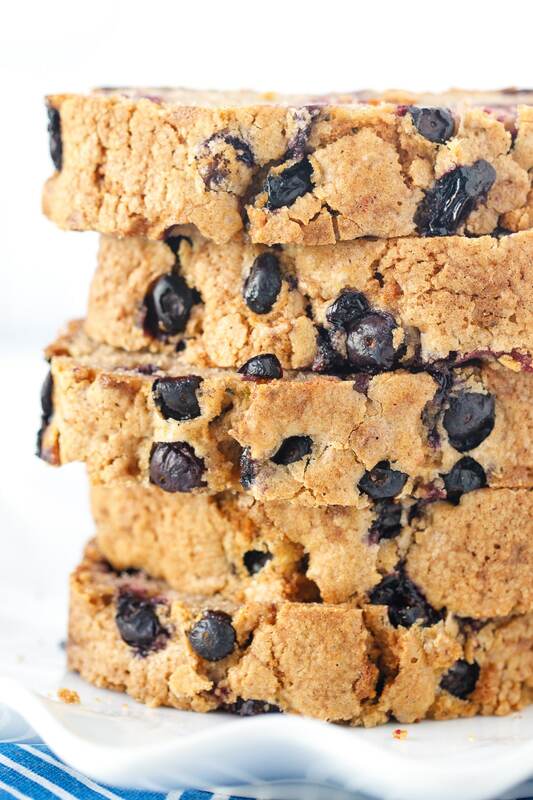 This blueberry zucchini bread recipe is truly outstanding. Here are the scrumptious ingredients that you’ll need to have on hand to make this yummy bread. 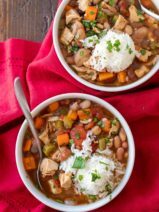 I am sure that at least one reader will jump on the comments and let me know that this recipe has too much oil. All I can say is, this recipe comes out amazing and I’m sure the oil does play a role in that. 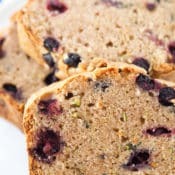 If you want to try a lighter version of this blueberry zucchini bread recipe you could try swapping the oil in this recipe for applesauce. 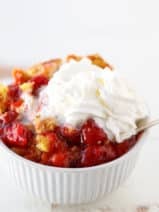 I haven’t personally tried the applesauce switch with this recipe but I’ve had success with other recipes in the past. If you try it, be sure to leave your feedback in the comment area to help our other health-conscious readers! Just a note, I baked my blueberry zucchini bread in glass pyrex loaf pans, which I find work really well for this particular bread recipe. 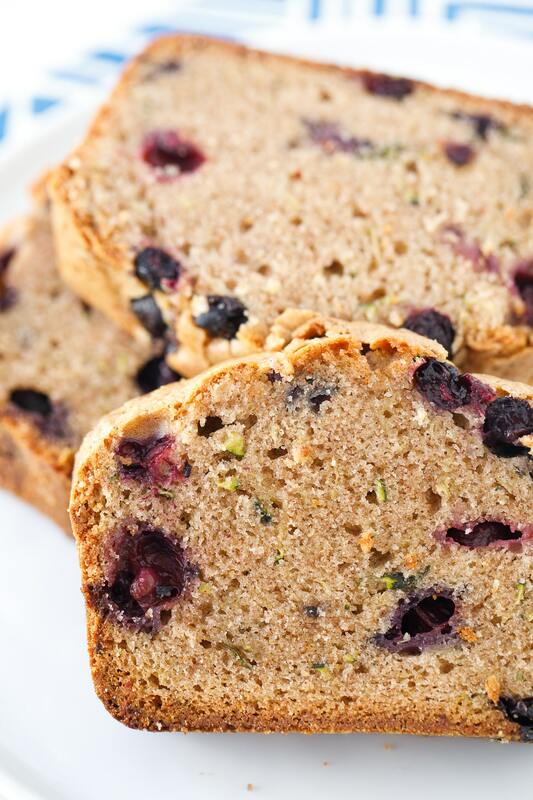 My moist and delicious blueberry zucchini bread is a huge hit with my friends and family. You’re going to love it! Preheat oven to 350 degrees. Lightly spray two 8 x 4 inch loaf pans with non-stick cooking spray. 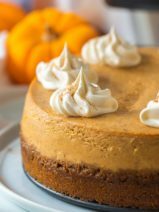 Whisk together the flour, salt, baking powder, baking soda and the cinnamon, set aside. In a large bowl, beat together the eggs, vegetable oil, vanilla, granulated sugar and the brown sugar. Stir in the flour mixture a little at a time until well incorporated. Stir in the zucchini. Stir in the blueberries. Pour equally into the prepared loaf pans. Top with additional blueberries, optional. Bake for 75 to 80 minutes or until a toothpick inserted into the center comes out clean. Cool on a wire rack in the pans for about 20 minutes. Remove from pans and cool completely before slicing. 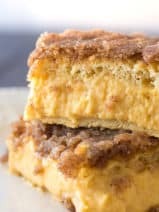 For this recipe, I used these 1.5-quart Pyrex glass loaf pans. Wow!! New favorite bread recipe. Yum. I could have eaten the whole loaf! And I love that its a double loaf recipe. Hi! Have you ever tried making this into muffins? 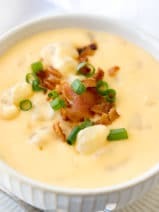 Any thoughts on cooking instructions for this? Thanks! !